Calling all jewelry enthusiasts! This Friday and Saturday (November 7th and 8th) make your way over to Neiman Marcus in Coral Gables and unleash your inner designer to meet Sydney Evan founder and designer Rosanne Karmes. From 11am to 6pm Rosanne Karmes will be hosting a custom diamond charm and bead bar while answering questions and interacting with attendees. 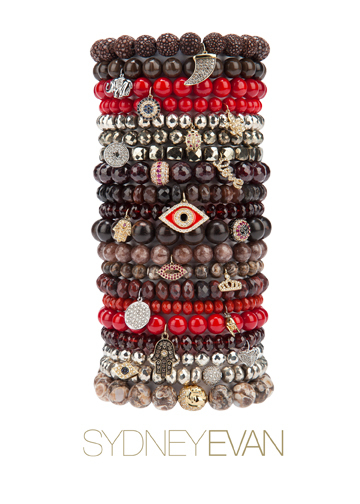 Jewelry enthusiasts and Sydney Evan fans will get to work alongside the designer while creating their very own personalized one of a kind Sydney Evan beaded bracelet and/or necklace that represents their personal style. Worn by celebrities Kelly Ripa, Kendall Jenner, Jennifer Lopez, Rihanna, Mina Kunis, Sarah Jessica Parker and many more; these unique pieces can be worn for all occasions and designed especially for you just how you like it. This interactive jewelry event at Neiman Marcus will be a fun, fabulous event for jewelry lovers are looking for a personal and individual pieces to add to their collection. The custom bead bar will feature a variety of 14k gold and pave diamond charms to choose from, including the brand’s signature spiritual styles like hamsas and evil eyes (a popular amongst the hottest celebs), lucky symbols, new zodiac charms, and Sydney Evan’s coveted “Love” word charms; paired with a rainbow of beaded bracelets or beaded lariats made from semiprecious beads or varying length chain necklaces. The custom designed jewelry peices will be available for pick up within 24 hours of ordering. You could certainly see your expertise within the article you write. The sector hopes for even more passionate writers like you who are not afraid to mention how they believe. Always follow your heart.